74" tall LCD stand folds down into convenient carrying case. VESA LG bracket holds up to 60" LCD or plasma TV, weighing less than 80 lbs. Aluminum display with wooden base is perfect for heavily trafficked areas. Hardware for mounting most VESA compatible TVs included. Customer is responsible for special screws if needed. his truss plasma stand is an ideal monitor stand for use at trade shows. A monitor stand, like a plasma TV stand and an LCD stand, has an intriguing truss design that will draw customers over to your booth. The entire display folds down to allow for easy transport, and is easily assembled in a few minutes with virtually no tools required. 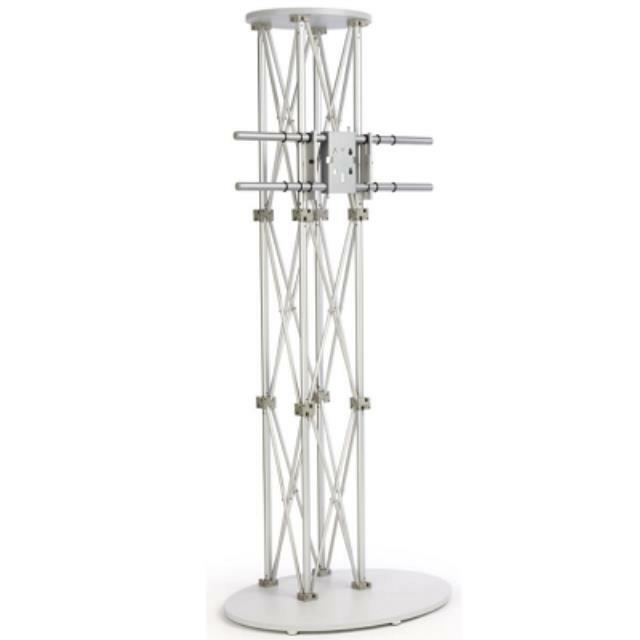 A 42" TV stand, monitor stand features truss poles that all screw into each other simply by turning each rod. The monitor stand has an oval base with (7) rubber tipped feet on the bottom to help with stability. This plasma mount not only includes the stand but a bracket to mount your television whether it is a Sony or another brand. This monitor stand can mount a 42"LCD and is also transportable by simply collapsing the stand into smaller pieces. This plasma bracket is VESA LG compatible which includes hardware that will mount most TVs including Sony brand televisions. Mounting a 42" LCD Sony to this monitor stand is often used for tradeshows or events because it comes with a traveling case that you can easily store the unit in. This LCD mount will be compatible with mostly any TV that is less than 60" and weighs less than 80lbs. A monitor stand has a carrying case to make transportation easy. The case includes a shoulder strap and fits all components except your television screen. This TV stand, monitor stand comes with a VESA LG bracket. VESA brackets are designed with manufacturers to fit almost all styles of televisions, and come with the necessary hardware to mount most TVs, though some may require specific screws you can purchase at a local hardware store. A monitor stand, also known as a TV stand and a 42" LCD stand, is the perfect display to bring to trade shows, where its portability and beautiful design will make your booth truly stand out. * Please call us for any questions on our truss stand for tv/monitor rentals in Shreveport and Bossier City, Louisiana.